On 17th June 2000, we played our first trio gig, at Manchester Royal Exchange studio theatre, as part of the Manchester jazz festival. 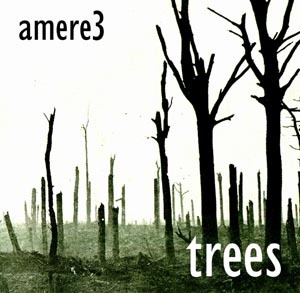 At the time we hadn't fixed on the name 'amere3', and so we were billed as 'fell, dainton & hargreaves', which sounds as much like a firm of lawyers as all the other three-name-trios around. As usual with Manchester Jazz Festival gigs, there was a full house (about 90-100), and both ourselves and bark (the other band on the bill) revelled in the attention. The following day we went into Parr St Studios in Liverpool and recorded 'trees'. Although we did one of my compositions (in sacred space) at the manchester gig, 'trees' is entirely improvised, and was recorded as it happened, direct to stereo. The results were much more varied than we (or at least I) were expecting. including one track ('coigue') that was teetering delightfully on the brink of being inaudible.